What a GREAT trip we had!! The only thing I have to say that was NOT good about it was the weather getting there and coming back home. Rain, snow, snowpack, hydroplaning, accidents in every direction ... it took us TWO hours just to get out of Los Angeles last Wednesday! Sheesh! Last night I went to a party for a very dear friend of mine. She and her husband are moving to California to be closer to her ailing mother. We have had some of the most awesomely-amazing, fun-filled trips with them. 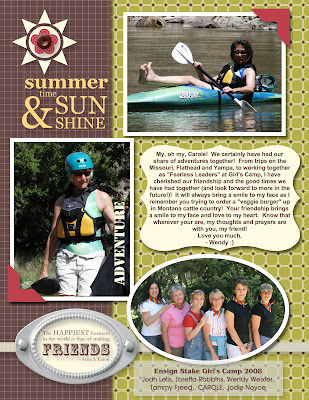 We were all asked to bring an 8 1/2" x 11" page for a little "goodbye book" that they were putting together for her. This is what I came up with using My Digital Studio. I printed it out on my home printer and it turned out FABULOUSLY!!! We are sooo gonna miss them. Good thing they are coming back in the summer to do another fantabulous river trip with a bunch of our friends!! Hugs to all for a GREAT weekend!! What a fun-filled couple of days we have had!! My head is swimming with TONS of fun, new ideas AND I have been THRILLED to be able to spend so much time visiting with my cyber-crafty friends! I keep telling Daven (Nolta, the SCS Guy!) that if it weren't for short people like me, tall people like HIM would never know they were tall, right??? 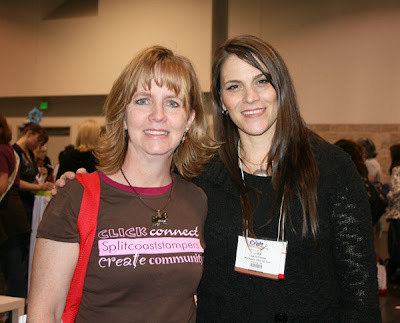 And I can't tell you how FUN it was to be able to meet and hug Lisa Johnson in person!! (Which is actually true to say of EVERYone I ran into!). It's almost as if we have all hugged before ... but I think all the chatting we do with each other online counts as cyber-hugging, right? 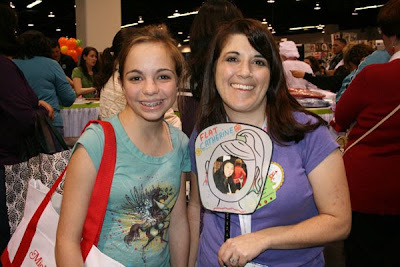 And how could I NOT say a HUGE THANK YOU to Marti Wills (owner of Pez-a-Doodle Designs) for being Amelia's "boss" for CHA??? She VERY graciously hooked Amelia up with a pass as an "unofficial employee" of Pez-a-Doodle so that she could get into the show. BIGBIGBIG hugs, girlfriend!! 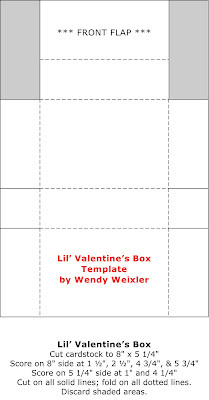 And ...... here's the drumroll ...... the long-awaited templates I promised for the Valentine boxes I created as part of the Control Freaks Blog Tour!! TA-DAAAAA!!! We are off to Disneyland today! What fun!!! I'll say hi to Mickey for ya!! After what was a VERY harrowing drive from SLC to Anaheim (Thursday night the roads between Provo and Cedar City were a NIGHTMARE - snowpack, one lane, blizzard comin' down!! 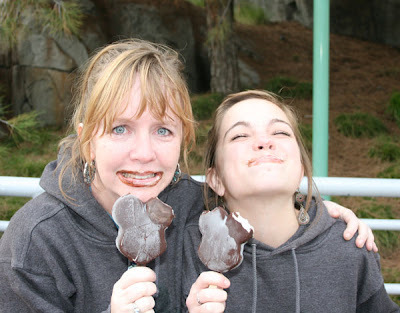 ), my daughter and I FINALLY arrived yesterday afternoon to spend a few days playing at CHA and Disneyland. 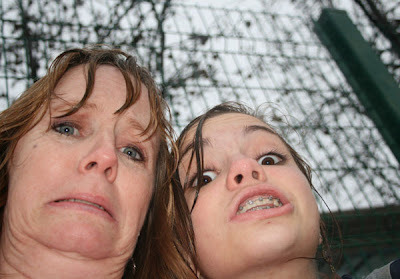 Don'tcha just LOVE this photo?? Yesterday felt like a family reunion!! 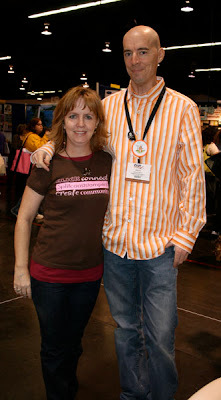 I ran in to SOOOO many of my stamping/paper crafting friends!! This was my most FAVE photo from yesterday!! 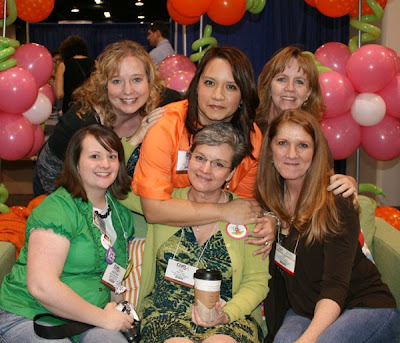 Front row - Heather Rolin, Deb Felts, Lynn Mercurio; Back Row - Connie McCotter, Jenn Balcer, and ME!! I have many more photos to share, but I won't be able to post 'em 'til tonight (so you will see 'em tomorrow morning!). 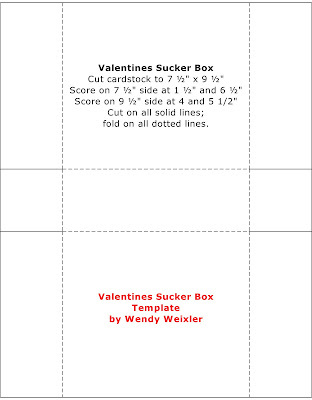 AND, I am almost done with the templates for my little Valentine boxes, so I will post those, too!! I have to apologize because I noticed, as I was looking back at my Freak Blog Tour post at the instructions I left that I TOTALLY goobered them up!! 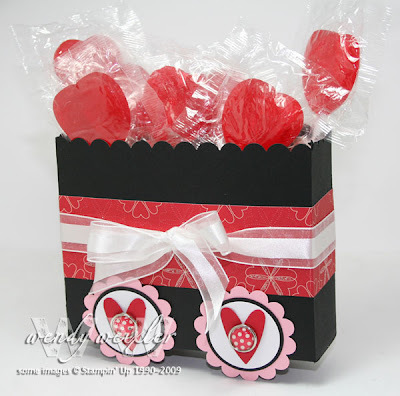 The dimensions were sooo screwed up on the little Valentine box with the cards inside. I have fixed them and you will get to see a visual tomorrow when I upload the file ... Thanks for your patience and have a STAMPERIFIC day!! OH!! And before I forget to tell ya, I have some VERY exciting news!! 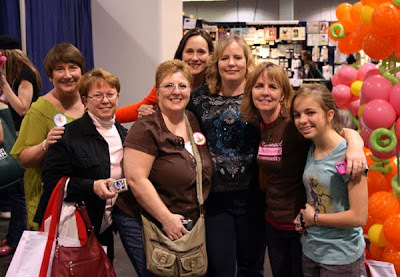 Many of you know (and many of you probably don't) that Stampin' Up started their own forum (kinda Splitcoaststampers-esque) for demonstrators a couple of weeks ago. (Sadly for some of ya, it is for demos only!). Anywho ... 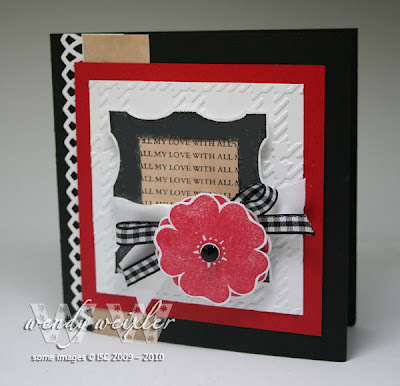 I found out this morning that I was chosen as their very FIRST Featured Stamper!! I have a silly grin on my face that probably won't come off for at LEAST a WEEK!!! Check it out, friends ... today's date - 01/22/10 - is a palindrome!! It is the same forward and backward!! So, as today's Limited Supply Challenge over on SCS (for which I am the hostess! ), I chose to ask everyone to create a card full of palindromes. Use a sentiment that was a stand-alone palindrome (like "MOM"), or at least one that had a palindrome IN it!! Plus, background paper, Cuttlebugging, etc., had to be symmetrical - a mirror image of itself - in order to be a palindrome, too!! Stripes, polka dots ... you name it!! There really are more options out there than ya think!! So, this is what I came up with!! It was super quick and easy! LOVE it!! 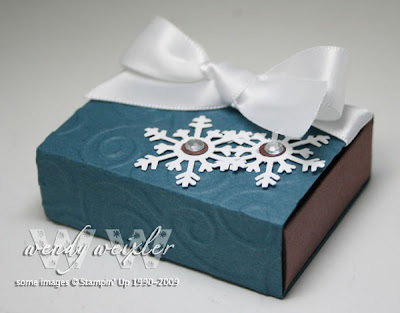 This next little project was also was done with a little box. This was a quick and easy little project. Wouldn't this just be ADORABLE sitting on a teacher's desk??? (You KNOW the kids would be swipin' those suckers in a hurry, though!) Told ya I was a "sucker" for Valentine's Day, though, didn't I??? To create this box I used a piece of Basic Black cardstock measuring 7 1/2" x 9 1/2", scored at 4" and 5 1/2" along the 9 1/2" side, and scored at 1 1/2" and 6" along the 7 1/2" side (just a little cutting and taping to assemble after that!). This is from a stamp sheet I bought from ISC just over a year ago. How sad is it that it hasn't seen ink until now? I love how peaceful these trees make me feel. There is something to be said about the serenity of fresh snow in a tree-filled area. LOVE that! And don't forget to come back tomorrow for the Control Freaks Blog Tour!!! You won't wanna miss it!! I have been asked a couple of times in the past week when I was going to show some more ways that I store things in my stamp room (in reference, of course, to the lovely article that was done about my craft room in Stampin' Success last April). I guess it is about time I made good on that promise. I will be posting some more photos for you in the next few days, so stay tuned! ALSO, the next Control Freaks Blog Tour will be coming up on Wednesday of this week. Don't miss it!! We just recently did another swap with the Control Freaks. I figured now was as good a time as any to clue everyone in to who the Freaks are and how we started ... (and I really LOVE how this card I did for our recent Occasions Mini swap turned out, by the way! As JanTink would say, "YILM!" - her acronym for "Yes I Love Myself!) Teeheeehee! 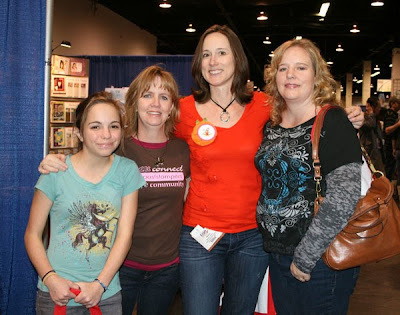 Anyway ... several years ago a few of the gals who started the Freaks were sitting together in a hotel room at a Stampin' Up regional event and perusing/discussing the swaps they had received. C'mon, admit it! Any of you that have EVER swapped have done this. You sit with your BFF's and try to see who got the ugliest card, right??? You laugh until tears are streaming down your face, right?? You KNOW you have DONE this!! Soooo...they got to talking and said, "Wouldn't it be be great if you could control the swaps you got? " Thus, the Freaks were born. 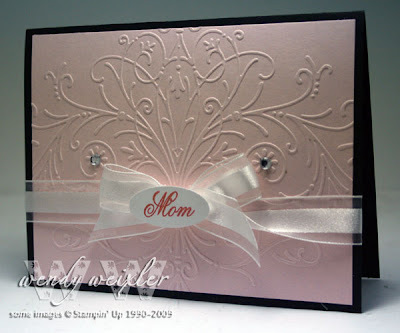 Lisa Martz, my dear friend who lives in Nebraska, is often referred to, by us, as the Mama Freak, as she is the one who started this group and she is the one who does all the gathering and re-disbursing of swaps. It is a by-invitation group (which, I have to say, I am still shocked/thrilled to be a part of!). Every time SU releases a catalog (including all mini's and the Sale-a-Bration one), a swap is announced and we are allowed to sign up for it. The Freaks group has over 40 members, but the swaps usually hover around the low 30's. 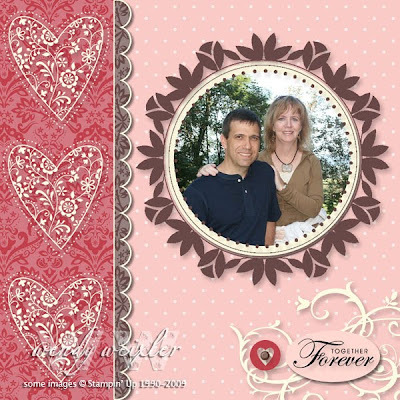 The only requirement is that was use only Stampin' Up products to create our swaps. And that is pretty much it. Sooo...after that long explanation you should now understand what it is to be a Freak! We started doing blog hops several months ago so we could share with more than each other. I have truly enjoyed being a part of this group. It's Freakin' AWESOME!! Hooray for new rubbah, eh??? Love is in the air! 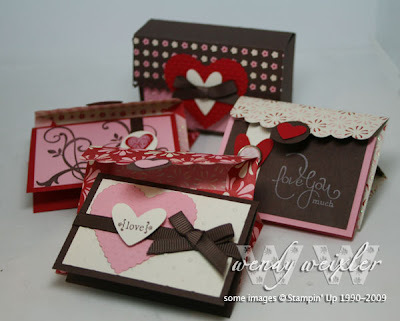 Can you believe we just finished Christmas and already we are looking ahead towards Valentine's Day cards? Good thing ISC has some new LOVELY images that we can use to help us create! 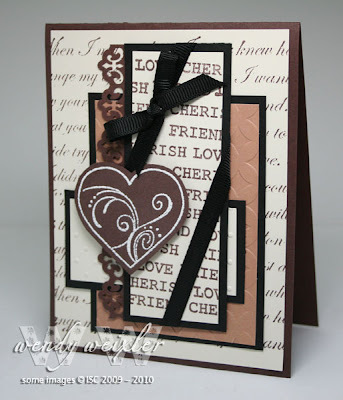 Today I am sharing a couple of cards I made with the new "I Heart for You" stamp sheet. 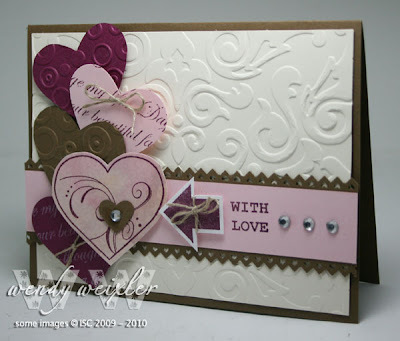 Here is the second card I created with I Heart for You as well. 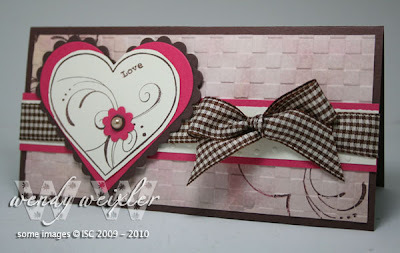 I love the elegance of the swirly heart image and how you can dress it up or down for a more formal or fun card, depending on your mood. There is a little bit in the new releases for everyone ... from an AWESOME background image (which is a GREAT large size!) to even a little bitty calendar image!! 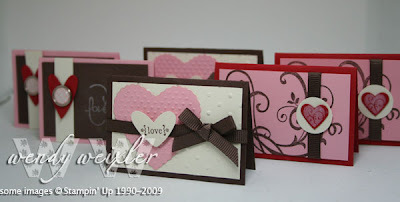 Be sure to drop by tomorrow when share what I created with the "With All My Love" stamp sheet images!! Sheesh!! What a month!! I have been running like my pants were on fire since Thanksgiving - rushing from one project right into the next! This is my latest (and hopefully LAST) big project for a while - the wedding favors I did for my friend and her daughter for her daughter's wedding. I made 300 of these little babies!! I thought I was going to lose my mind!!! The worst part? 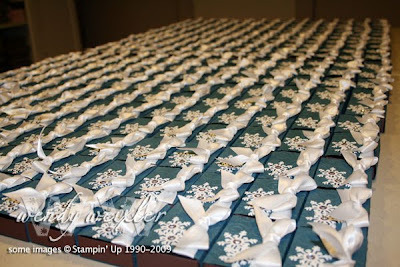 When I was down to what I thought was the "end" - tying the ribbons onto the boxes - it took me EIGHT stinkin' hours!!! EIGHT!!! I nearly lost my mind!!! I am soooooo glad to have these out of the way!! 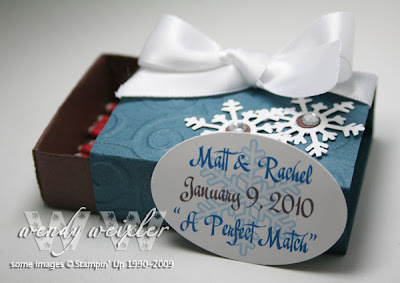 I think I am going to start stamping some things that don't require me to run around for a bit (famous last words!). 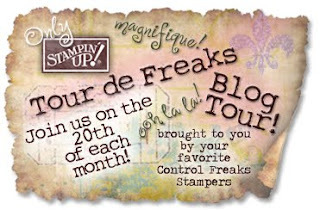 We DO have a new release coming out this week for Innovative Stamp Creations AND there is the next Control Freaks Blog Tour coming on the 20th. I hate to admit that I have spent the better part of the last two days decompressing and watching episodes of Grey's Anatomy online (how embarrassing!!). My brain has officially turned to mush!! ... something borrowed, something blue!!! 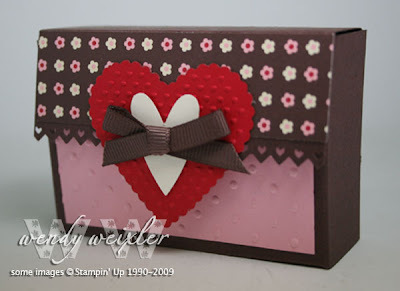 Okay, well ... to be fair, I didn't use "something borrowed" ... but here is a card I did for today's TLC over on SCS - TLC254 (paper quilting). 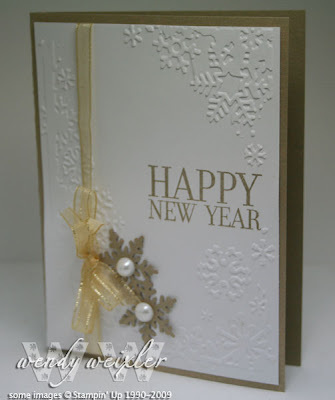 The VERY FIRST card I ever posted on my blog here was a paper quilt (check it out HERE)!! That's is where the "something old" comes from. 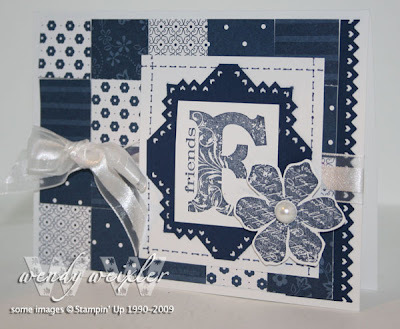 "Something new" could fit a lot of stuff on this card - the patterned paper, the stamp set, the ribbon, the punches - I got that one covered for sure!! As for "something borrowed" - I guess I could stretch it and say that the "faux stitching" is a technique idea I borrowed for today's challenge!! And the "something blue" is rather obvious ... funny thing is, this is NOT a wedding card!! Hehehehe! Speaking of weddings ... I am currently working on - yes, count 'em! - 300 wedding favor boxes for a wedding that is THIS Saturday!! HOLY COW!! So, if I am not around too much, y'all will know why!! Wowza!! I can't believe it has been OVER a week since I have posted anything here!! Too much to do and not enough time to do it all, I guess. I think today I am going to read a book and take a nap!! 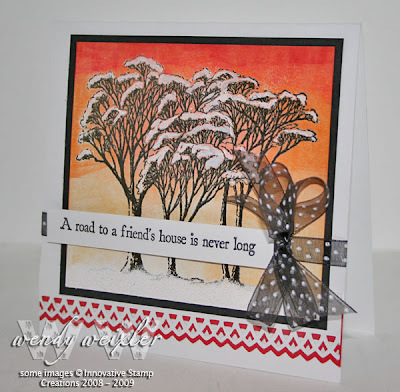 I actually thought about stamping something "just for fun" today, too!! Here is what I came up with. I hosted the LSC on SCS this morning as a last-minute fill-in kinda person (LSC253). I chose to do a "Happy New Year" card in every way ... the challenge was three-fold" (1) "Happy" - stamp the card in 15 minutes or less (which, of course, is happy 'cause it means you will have time leftover to stamp ANOTHER card); (2) "New" - use something you got during the holidays that is fun and "new" to play with (in my case I used the Cuttlebug snowflake border embossing folder I got in a bundle pack); and (3) "Year" - the card needed to be something commemorating an annual-type event - like a birthday, anniversary, or even New Year's> And that is pretty much it!! I have a mountain of laundry, mountains of messes to clean in my craft room and a MOUNTAIN of books to read ... which is just what I think I will do!! 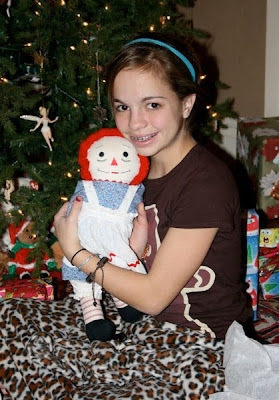 And ... by the way ... my daughter LOVED her Raggedy Ann's makeover! !